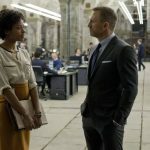 In the opening scenes of Patriot Games Jack Ryan foils an IRA plot to kill the Queen Mother’s cousin outside Buckingham Palace, preventing a car bomb from exploding and engaging in a lethal shoot-out with the terrorists. 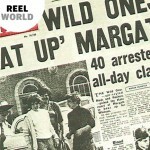 It is an exciting and involving moment, and sets up the revenge motive that drives the remainder of the film. 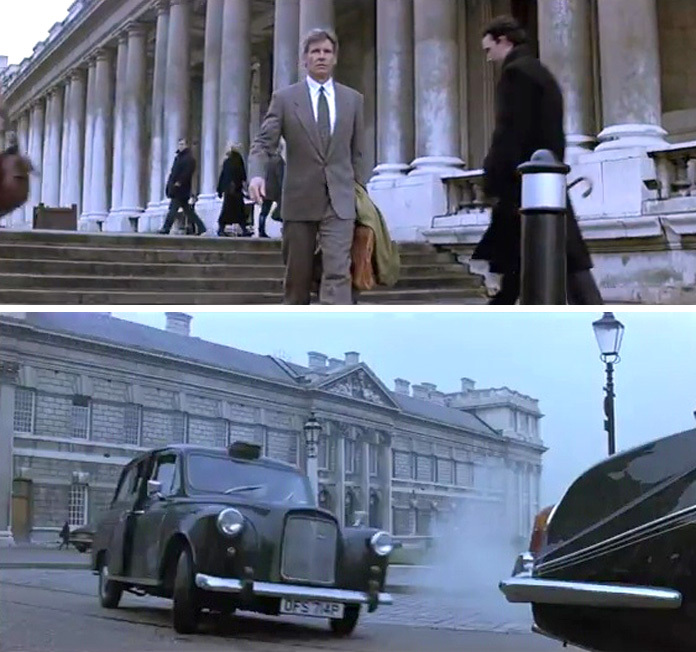 And yet Harrison Ford was actually photographed in front of the Royal Naval College, Greenwich for this sequence, a building erected two hundred years before the Palace as a hospital for sailors and more than five miles from it. Why, then, does this architectural sleight-of-hand convince? The triangular pediment and corner pavilions of the College seen in one shot are similar to those on the real Buckingham palace, whilst the imposing colonnades in another trigger an association in cinemagoers’ minds with what they think the Palace looks like. The Classical architectural elements, common across the centuries, help sell the illusion. The richness of London’s architectural heritage often provides such understudies when the preferred location is impractical or impossible, and also facilitates the more difficult pretence of realising locations that do not actually exist. An appreciation of architectural styles and the almost subliminal cues they generate allows both to be accomplished. Bankside power station, a vast, windowless brick box designed by Giles Gilbert Scott in the late 1940s, became a forbidding prison in Richard Loncraine’s retro-futuristic Richard III (it is now Tate Modern). There is no Gotham City courthouse, and so for Batman Begins Rachel Dawes confronts Dr Crane in the lobby of the University of London Senate House opposite the British Museum; architect Charles Holden’s 1938 building has elegantly chaste stripped-Classical interiors in creamy travertine stone that approximate North American civic architecture from the same period. When the Jones boys nervously enter the vaulting concrete terminal of Berlin airport in Indiana Jones and the Last Crusade, meanwhile, the severe ‘form follows function’ aesthetic practiced by European Modernists like Le Corbusier is being emulated through use of the Royal Horticultural Society, Westminster’s dramatic 1928 exhibition hall as stand-in. Stanley Kubrick’s firm aversion to foreign travel set an unprecedented challenge when his next project was announced. 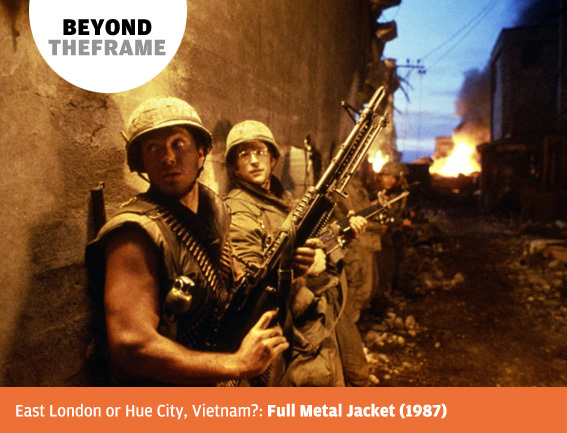 Set during the Vietnam war, Full Metal Jacket would need to feature extensive urban combat scenes yet be filmed entirely in Britain. 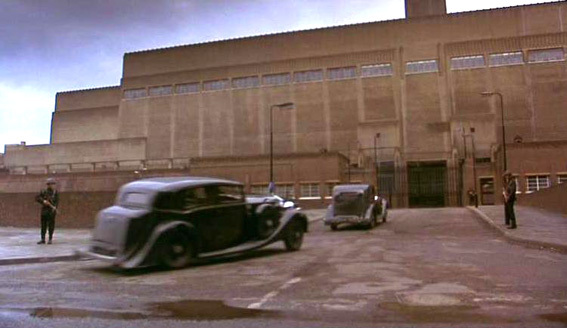 Production designer Anton Furst settled on the derelict Beckton gas works in east London as the basis for a surrogate Hue City, where the climactic battle of the film takes place. Purposely collapsing some of the looming brick and concrete industrial structures helped, but crucially the site had acquired a new set of administrative offices in the 1930s. Their massing, horizontal windows and rendered walls were a remarkably close match to similar buildings erected in Hue at the same time by the then colonial authorities. 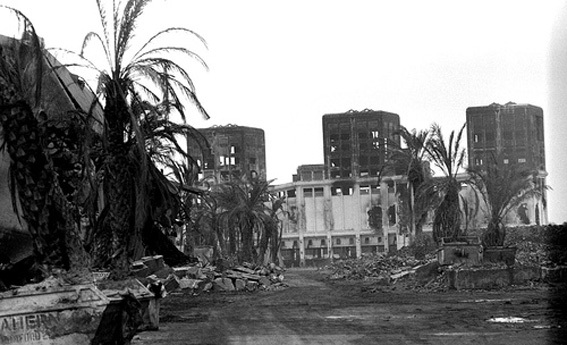 Paint, signage and imported palm trees completed the effect, one of the most impressive feats of staging in modern cinema that was achievable only through knowledge of architecture. Ironically, the interiors of London’s own Houses of Parliament are frequently ‘doubled’ by the Victorian swagger of Alfred Waterhouse’s Manchester Town Hall. On screen, architecture isn’t always what it seems.